: I grew up with Elvis, and remember when he first started his career. : His looks, voice and moves!!! : You ARE truly the KING and loved by so many. 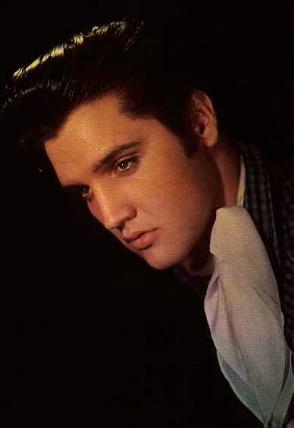 : I think true Elvis fans raised their children listening to Elvis and it has just carried on through the generations. Thank you Sandra for sharing your feelings and memories with us on our survey. My youngest is 6 and he thinks Elvis is the best, he recently commented on the clip when he seen Elvis singing `If I can Dream`, telling me he really likes the song. Our little people are the future Elvis Presley fans. His legend will always be honored. -Elvis in 1956, talking about his way of moving on stage. "I ain't no saint, but I've tried never to do anything that would hurt my family or offend God...I figure all any kid needs is hope and the feeling he or she belongs. If I could do or say anything that would give some kid that feeling, I would believe I had contributed something to the world." -Elvis commenting to a reporter, 1950's. -Elvis often used this adaptation of a well-known quotation. -Talking about the informal jam sessions he and the band and entourage enjoy each night during the lengthy Vegas engagements. These happen upstairs in Elvis` suite at the Las Vegas Hilton as they all try to `wind down` from the excitement and energy of the live shows. Quote is from a 1972 taped interview used in MGM`s documentary `Elvis on Tour`. -From a 1972 taped interview used in MGM`s documentary `Elvis on Tour`. -Elvis at a press conference prior to his 1973 television special, `Elvis — Aloha from Hawaii, via Satellite`.